It’s hard to believe that only just a year ago, I didn’t realize there was a difference between hay and straw. To listen to us speak now about the types of grasses in our pasture, one would wonder if we had a degree in field grasses! 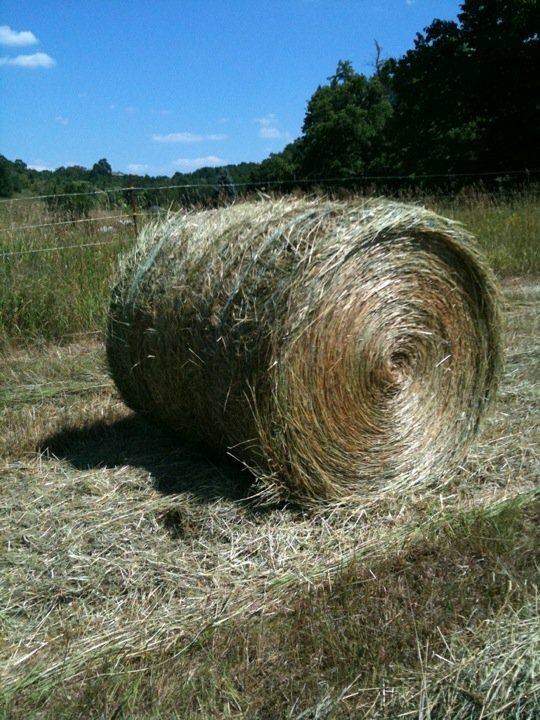 As we got closer to hay season, we began to wonder if we should invest the money into buying used haying equipment, or if it would be simpler to have someone else hay the fields for us. After many hours of searching on Kijiji, we finally found a retired farmer who was selling a haybine. It needed work, but after a few hours of repair we were able to get it up and running. It took 3 more weeks to find a baler we could afford, once again Kijiji led us to our new acquisition. We were now the proud new owners of haying equipment…but could we actually hay the fields? Could we manage to learn how to use the equipment in time to get the hay in? In the words of my 89 year old neighbor “Your field looks like it got a two dollar haircut”! And of course, no sooner had we finished baling the first 9 rounds of hay – but the weather forecast changed and the hydraulics went haywire on the tractor. We stood in misery watching the storm that night, the downpour soaking our freshly baled hay. I am sure our anguish was visible, we were so pained to see all of our sweat soaked efforts go down the drain. However, the hay is baled. It’s now stored inside of our pole barn. That’s what counts right?